Is fine cuisine worth its exorbitant price? Sometimes, although price can be an unreliable indicator of quality. But when I have had the opportunity to indulge in high-end dining, I’m struck by how many diners don’t seem to be enjoying their food. In fact, the food seems to be an afterthought for the majority who are focused on showing off the depth of their wallet, being a general lout, taking care of business, partying, or gossiping about the latest celebrity in rehab. Fine cuisine is wasted, if not on the rich, surely on the bored, distracted, or ignorant. Food writer Jay Rayner in his book The Man Who Ate the World noted the same phenomenon in his worldwide quest for the perfect meal. In France, the food culture is a bottom-up affair, with high gastronomy only being its ultimate expression. The notion of Le Terroir to which every Frenchman cleaves—that there is a specific piece of land from which their identity comes—may well encourage gastronomic conservatism, but it does at least lend the whole business a certain democracy. So what about the food culture in the United States? 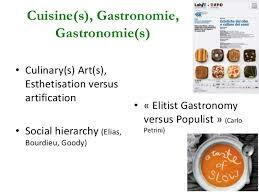 Is it a top-down affair where celebrity chefs create wondrous creations for status-driven consumers with too much money? Or is the growing “foodie” culture a place where genuine appreciation is rooted in deep knowledge of ingredients, methods, and traditions? Aside from redoubts such as Louisiana where food traditions have long had a grip on the public, Americans discovered their palate only a few decades ago. Do we have what it takes to join the great cuisines of the world? Critics of the idea that food can be art claim that flavors are not about anything—they don’t tell stories or give insight. Thus, food lacks the intellectual credentials to be a genuine art form. I debunk this argument in my Three Quarks article for this month. Usually when chefs talk about their “philosophy”, it amounts to a few platitudes about using fresh ingredients or locally-sourced ingredients—admirable and tasty but calling it a “philosophy” is a bit inflationary. But Chef Pelaccio, owner of Fish and Game in Hudson, New York really does have a philosophy and an intriguing one as well. Concerned about the amount of waste and spoilage that results from restaurants having to stock ingredients for dozens of dishes that customers may or may not order, Palaccio designs his menu around only a limited number of locally-source ingredients he has on hand, buying whole animals and integrating various cuts into the dishes as needed. Each customer gets a slightly different meal depending on what’s available. Fish & Game runs a single, set menu each night that we’re open. All the meat and produce (and dairy, excluding cheese) that we use comes from the Hudson Valley itself, with a strong emphasis on the products of Columbia County. The seafood comes from the North Atlantic. The menu changes every week, and sometimes even night-to-night, changing with the seasons, and what is available locally. Prix Fixe menus are neither new nor remarkable. But what is different is the philosophy behind it. The steps we took thus involved what may at first glance seem like two opposing ideals: presenting dining as entertainment, while simultaneously embracing the possibility that a customer comes to a restaurant to discover our food myths, not to impose her own. At Fish & Game, we are the curators of the evening’s experience; we determine what will be served and how it will be cooked. Customers don’t choose what they want to eat; they come to experience what the chef has in mind for the evening. To establish our own mythology (read: a culture of cuisine and the lore surrounding it) we had to set our own parameters. Any rigorous practice (spiritual, physical, aesthetic, what-have-you) tends to have “constitutive constraints”–parameters that both constrain and enable that practice. Ours are geographic: we rely on the Hudson Valley and the North Atlantic for our seafood. All mythologies are born out of the earth, sky and water–and when we conjure our flavors, fire is our most important tool. We are developing a cuisine of our region, informed by what grows well here, and what we brought to the party from our past lives. My Hudson Valley cuisine may be vastly different than my neighbor’s, but so may be our life experiences. Our hope is that this could also be an interesting proposition for diners. There is air-tight logic behind this approach to dining. …it might be useful to think about dining out as akin to going to a show. A member of the audience doesn’t ask to omit obscenities from the script of a Broadway show. Nor does one offer his version of the desired set list when going to see a concert (though I’m sure we’ve all encountered the guy in the front row shouting the title of one song, over and over again, to the annoyance of both performers and the rest of the audience). Nor, however, is the artist in a solipsistic bubble in which she only considers her own preferences. The art is both inspired by and at the service of the community that fosters it. But not on the model of “choice”-driven production or consumption. This is what is revolutionary about Pelaccio’s approach. We would think it absurd for Picasso to consult with his fans before deciding on a color palette for a painting. It is Picasso’s vision we want to see; not the averaged preferences of his patrons. Why are chefs different? If this philosophy were to sweep the fine-dining business, we would have lot more unique restaurants with something original to offer, instead of countless “wanna-bes” trying to please everyone by following the latest trends. I’m not optimistic that this will succeed. Americans love their choices even when they are disadvantaged by them. But I hope it does well; it would be good for the culinary arts. Here is a bit of conventional wisdom: Each of us is an expert on what we like and picky eaters are not at fault for their fussy attitude. If I hate sushi, I haven’t made a mistake or committed a crime. I can’t help it; I like what I like. But that bit of conventional wisdom is wrong. Here are ten reasons why you shouldn’t be a picky eater. 1. We are not experts on what we like. Our tastes change constantly and in surprising, unpredictable ways. Remember hating asparagus as a kid or never liking sardines until having them grilled on the beach in Sicily? We often dislike something because our experience with it is limited or because its presentation was unflattering. 2. Picky eaters are well on their way to a life of blandness and tedium unless they compensate in some other way. The world of flavor is large and diverse and promises a different experience each day. Life is just more interesting when you eat widely. 4. Curiosity about food can stimulate your desire to travel. 5. Omnivores are open-minded about food and being open-minded is a good habit to develop in general because you discover more value in the world. Being open-minded about food can help develop that habit in other areas of life. 6. Picky eaters experience less pleasure, are less curious and will have less self-knowledge than omnivores unless these deficiencies can be made up for in some other way. 7. Picky eaters are dogmatic and inflexible about food. It is in general a bad idea to approach any aspect of life by emulating Professor Umbrage on a bad day. 8. 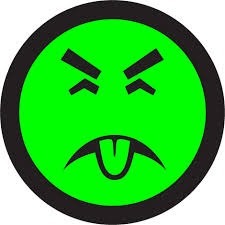 Picky eaters harm themselves because they don’t develop their capacities for sensation to the fullest. We are designed to get pleasure from diverse foods. Picky eating is like being willfully color-blind. 9. Picky eaters inconvenience others and are often disrespectful and thankless since they cannot fully endorse a gift of good food when served something they don’t like. 10. Picky eaters miss out on shared experiences they would otherwise enjoy. Of course, some people are off the hook for refusing to try some foods. Vegetarians and vegans have moral objections to eating certain foods that are worthy of rerspect, and these objections would have to be weighed against the virtues of being omnivorous. People with health issues cannot be expected to sacrifice their health. And if you think of food as fuel only and get no pleasure from it, then you lack the motivation for food adventures. Everybody else should stop whining and eat. I get hysterical over a lot of things, but the tasting menu isn’t one of them. If I don’t want to eat that way, I don’t go to the restaurant. Has Soltner never heard of performance art? I suppose painters need paint only when inspired. But musicians, dancers, and other performance artists have to turn on the inspiration when the stage lights go up. They don’t get to choose. That is what it means to be a performance artist. Chefs are no different, but that tells us nothing about whether chefs can be artists. Chefs who consider themselves artists are indeed setting themselves up for failure, as Soltner cautioned any cook who would listen. Only once they have become a superlative craftsman (Grant Achatz comes to mind, raising the dining experience to a kind of performance art) should they even attempt to raise food to the level of art. This is exactly right. No artist can succeed unless they master their craft first. Musicians must build dexterity and learn composition; most painters must learn to draw, understand color, paint mixology, and perspective; dancers must acquire flexibility, strength, coordination, musicality, and expressiveness, etc. Anyone who thinks artistic creation is about only inspiration, emoting, or idle brainstorming hasn’t spent much time around genuine artists who devote much attention to their craft as well as their art. The fact that artistic cooking requires precision, concentration, and flawless execution does not distinguish it from any other art. The U.S. is the home of countless “reality-show” cooking competitions—Top Chef, Iron Chef, Hell’s Kitchen, Chopped, etc. But when it comes to the real thing. Eh, not so good. Bocuse d’Or, a biennial international cooking competition in Lyon, France, is probably the most highly regarded test of culinary artistry. Since its inception in 1987, the U.S. has never managed to finish higher than a tie for 6th Place in the competition. The top finishers are usually from France, of course, but also Belgium, Norway and Sweden among others. The next competition comes up in January. Chef Richard Rosendale, executive chef at The Greenbrier, in White Sulphur Springs, WV. and winner of Bocuse d’Or USA will represent the U.S., assisted by Corey Seigel, also at Greenbrier. For much of its history a culinary backwater, the U.S. has undergone a culinary revolution in the past 50 years. American chefs have achieved celebrity status and even ordinary neighborhoods now include an extraordinarily diverse collection of ethnic restaurants that serve as incubators of the culinary imagination. Is this revolution mostly just PR and cheap eats or is there an infrastructure of culinary artistry emerging that puts American food culture on a par with the other great cuisines of the world? 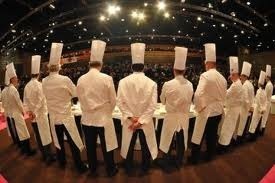 The Bocuse d’Or competition is one way to find out. Good luck to Chefs Rosendale and Seigel! Is Cooking an Art or Craft? I think the difference between art and craft is that in craft you care what the person consuming your product thinks. I’m a craftsman, and I believe that in many ways it is a more noble profession than being an artist. I doubt that this is true as a generalization. I know plenty of artists who care about what their audience thinks. This is a matter of individual temperament. But there is something right about Shopsin’s distinction. Chefs, after all, are in the instant gratification business. We consume their work, quite literally, and in a relatively short period of time. The aesthetic qualities must grab us quickly or they will be missed. And so the chef must know and aim at what will immediately light up the diner’s palate. Most artists and musicians create more enduring works that can be sampled over time, returned to, puzzled over, etc. Understanding may come in stages after lengthy reflection—they need not grip us instantaneously. Artists and musicians have a bit more liberty than chefs to create works that lack immediate appeal. The distinction between craft and art has nothing to do with an aim to please. Rather, a craftsperson is making an artifact that serves a purpose. It will be used for something, decoration being among the most common of uses. That means that the nature of what she creates has already been conceptualized and formulated—the end result must serve its purpose well. Thus, the craftsperson must have a clear idea of what the finished product will be when beginning a project. Art has a different starting place and a different aim. Works of art typically don’t begin with a fully worked out conception of what the finished product will be because they don’t serve a practical purpose. Artists are usually trying to clarify a vague intuition or vision. There aim is to explore an impression, perception or idea using a sensuous medium. The end may not be clearly in sight because the point just is the exploration. “I like to surprise myself” is something you hear artists say often. And artists often talk about starting off in one direction and during the process finding themselves making something quite different with its own momentum. The British philosopher RG Collingwood thought this is what distinguishes art from a craft. While the craftsperson, if she is skilled, knows what she wants to do; the artist “does not know the end in the beginning”. I doubt the truth of Collingwood’s generalization as well; I doubt that there is one method of creating art. Some artists work with clear intentions; others not so much. But regardless of the creative process deployed, successful works must be open to reflection, exploration, and interpretation outside of known boundaries. Their horizon cannot be shut down by a relentless focus on serving a practical purpose. So can chefs be artists? It is a challenge because they must simultaneously produce immediate gratification while maintaining that openness to reflection, exploration, and interpretation. The fleeting, transitory nature of food makes it an unlikely candidate for an art object. But this is a practical challenge, not a logical roadblock. The best chefs—Adria, Keller, Achatz, Redzep-manage to create food that is gratifying and an exploration as well. But because cooking often requires great precision and thus planning, the creativity may not be in the execution but in the conceptualization. Should we consider food among the conceptual arts? The episode has receded from the front pages, reporters are no longer camped on doorsteps, and Attorneys General have disbanded their grand juries, but the controversy lives on. Did Top Chef contestant Marcel Vigneron rip off Wylie Dufresne’s egg recipe? Some claim it is too hard to sort out who is the original creator of a dish and it’s common practice for chefs as well as other artists to rip each other off anyway. So their should be no ownership rights in a recipe. Other’s claim a dish as original as Dufresne’s egg recipe deserves recognition as a work just like any other work of art. Chefs who use such a dish for their own purposes should acknowledge their source. If creations of innovative chefs deserve the status of works of art, then we cannot treat these works as replaceable fodder to be appropriated at will by chefs trying to burnish their credentials. However, most cooking joins many other forms of contemporary art best understood as a collaborative effort. The idea of the auteur—the notion that a work reflects the personal creative vision of an individual genius—strains credulity in many contemporary art forms such as rock music, jazz, or film and utterly collapses with mash-ups and digital music sampling where entire portions of songs are lifted out and inserted into a new work. The idea of an “original work” with a clear origin is, in many cases, simply inappropriate. In fact, it may be inappropriate in most artistic endeavors. As the post-impressionist artist Paul Gauguin once remarked: “Art is either plagiarism or revolution.” If a work is not utterly unfamiliar, it rests on a foundation of borrowing from earlier works. Cooking belongs in this category—the tradition of sharing recipes suggests the collaborative model is the right one. When a dish is an elaboration of a traditional dish, claims to originality don’t hold much water. No one owns the recipe for Beef Bourguignon and variations on the recipe cannot claim much originality even if the variation is innovative. There are only so many ways to make a beef stew, so there is bound to be many overlapping recipes even among recipe developers striving for a new take. I don’t see the point in worrying about origins in these cases. Furthermore, it would be unfortunate if recipe developers were inhibited by worrying about duplicating someone else’s work. That would not be good for cooking or the sharing of ideas. Of course, if the idea of a “pure origin” in cooking is a fantasy, chefs and bloggers should not hesitate to acknowledge the source from which they get a recipe. If no recipe can claim utter originality, then one should not claim it for oneself. Giving attribution must be the norm, although the question of how close a dish must be to the original to warrant acknowledgment is a difficult call. However, Dufresne’s recipe is not a modification of a traditional dish. 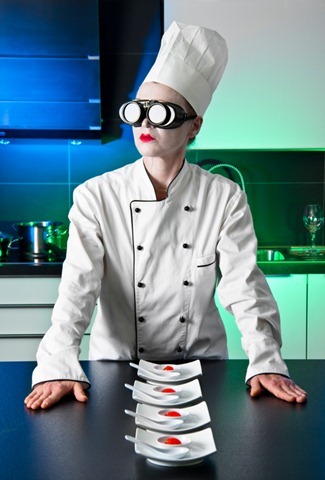 The current state of molecular gastronomy may be an exception to my “no auteur” point of view. These are new techniques using ingredients seldom used in traditional cookery. It is a field where innovation and experimentation is rampant and tradition typically plays little role. New dishes are, in fact, new dishes. Thus, Dufresne might have a stronger moral claim here against Vigneron than more conventional chefs. If you are going to steal, do it well.